This Babe Swine toothpick holder is definitely one of the most adorable animal on planet earth! Get ready to smile every time you enter your kitchen with this cute piece of home decor. Featuring a beautifully painted pig smiling from ear to ear, it holds a small barrel in its hooves, presenting you with toothpicks any time you need them. 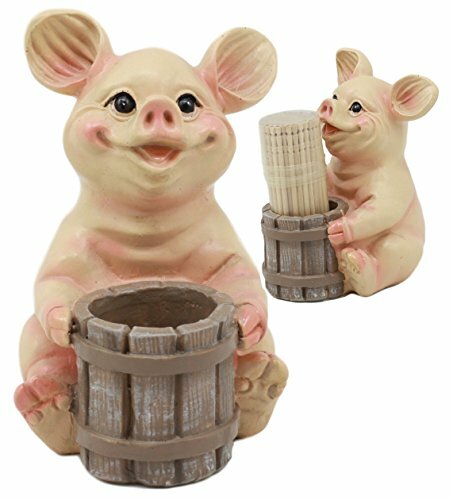 This Cute Porky Pig Holding A Wooden Barrel Toothpick holder is made of high quality polyresin, individually hand painted and polished. This Cute Porky Pig Holding A Wooden Barrel Toothpick holder has dimensions of 3" x 2.5" x 3.5"Tall approximately. Toothpicks packed in a small plastic container as pictured are provided in the item box.